Search for the best flight prices from Manchester to San Francisco. Compare prices, book today and save money with Manchester Airport. A trip to the northern reaches of California is well rewarded with a visit to San Francisco, representing a goldmine for the everyman in its rampant provision of nature trails in the Golden Gate National Recreation area, reachable when crossing its iconic suspension bridge namesake. Cradling the Pacific Ocean and often cloaked in a mystical mass of fog, San Francisco alludes to throwback beauty and intriguing charm. Novel modes of transport include the regular sight of cable cars, while Victorian architecture or 'Painted Ladies' as nicknamed by writers visiting the city, are a regular feature of San Francisco suburbs, depicting houses embellished with three or more colours to accentuate its features. San Francisco hotels are as diverse as the surrounding terrain, with chic boutique offerings and soul warming inns juxtaposing with grandly decadent period builds and contemporary high-rise hotel chains. Booking a hotel stay in the city as early as possible is highly recommended, with an assortment of boutique hotels such as The Mosser and Clift San Francisco marrying style and comfort without breaking the bank. in particular ensuring a competitively priced market under the more extravagent allure of established hoteliers. The technology boom in the city is offset by a reassuring rise in eco-friendly hotels, including a city first in the Financial District's all-green hotel, The Orchard Garden. A truly uncompromosing free-spirit, America's birthplace for free-thinking revolution, whether in the form of poetry or technology, San Francisco also provides a shopping experience to thrill and excite. 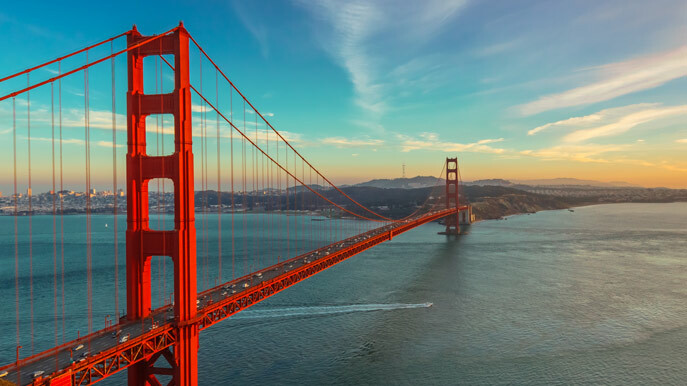 Whether you're looking for San Francisco made souvenirs, thrift store bargains, or leading fashion house apparel, The Golden Gate City has it all. The primary port of call for retail therapy in the city for many travellers is Union Square, housing many leading retail brands including Bloomingdales, Macy's, and Neiman Marcus surrounding a sprawling, palm-tree lined communal walkway. The San Francisco dining scene is ranked among the best in the USA, with Michelin-star winning chefs heading up some of the finest eateries this side of the globe. The city is certainly not restrictive to high-end dining however, with plenty of affordable dining houses offering a plethora of organically farmed dishes, while speakeasy vintage saloons act as a nostalgic reminder of the Wild West and Prohibition-era roots. Jazz enthusiasts can enjoy mixing soothing ambient notes with equally pacifying culinary delights in Fillmore Street, known for its music venues and jazz roots, where visitors can enjoy the likes of Florio on 1915 Fillmore St. in blending classic Italian aesthetic with esteemed chicken based meals as a mainstay of Pacific Heights, while Balboa Café dates back to the early 1900's as a saloon with character. Spring season in San Francisco provides an opportunity to celebrate the sublime and the innovative of contemporary cinema at this much lauded film festival and San Francisco Film Society’s ultimate showcase. Over 170 films are screened each year, including several US and international premieres, with several iconic city venues taking part in the showcase, including the Roxie Theater and Castro Theater, and regularly attracts audiences of 70,000 or more across the two weeks. Carnaval sees one of the biggest celebrations of multi-culturalism across the state of California. Vibrant fusions of Caribbean, Latin-American, Brazil and Tobagan cultural influence sees a rainbow of colour descend on the city in the form of glitter strewn dancers, before a culminating Grand Parade housing an assortment of delicious street food as exotic and mesmerising as the festivities themselves. Music aficionados in California have Outside Lands marked down as a must in their summer calendars. Around 200,000 revellers descend on the park site, around 25-minutes drive out from San Francisco International Airport, to enjoy a stellar line-up which has seen the likes of Arctic Monkeys, Metallica and Radiohead grace the stages at this eco-friendly festival feast. Literature fanatics may well see Litquake as a reason to visit San Fran alone. A gloriously debauched combination of books and beer sees a weeklong smorgasbord of literary activities and author readings, before moving onto a 'Lit Crawl of Mission bars'.